"Modern Ragtime Guitar Solo" is welcoming you. 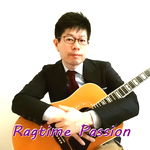 "Ragtime Passion @ Guitar" is the site for introducing the works and stories of myself and beyond, especially including "Tabs for Sale"; you can get tabs of my arrangement, some of which are just posted on YouTube. 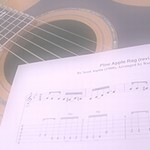 I hope you will enjoy all contents - some are introduced below - and contact me someday for challenging this style - "Arts and Crafts of Fingerpicking Guitar" in beautiful heritages of music - "Classic Ragtime". and SOME GIFTs will be available capriciously. # Invited and performed at "21th Zehnders Ragtime Festival" in MI, USA." Honored to be invited by the famous American "Ragtimist", Mr. Robert Milne, I had joined and been playing Ragtime Guitar at "21th Ragtime Festival at Zehnders of Frankenmuth". It's one my great experiences and journey of Musical life, and I'm so grateful to all the people I met there, especially lots of wonderful musicians... and really thank you - Bob-san!! 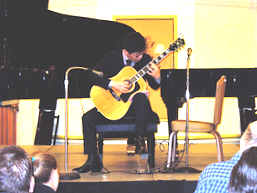 In my turn, I had often started with Japanese old song as an introduction of American Folk rag. Here show you a re-arranged version in Habanera style - Click PDF icon to get SAMPLE... and check the sound video on YouTube. Released the memorable CD of Joseph F. Lamb - One of the famous "Big 3 in Classic Ragtime composers". Visit Promo site by CLICK the left image. Also you can purchase from me, with Special Gift "Pdf Tab sheet of Walper House Rag". If you'd like, contact me. One of my main works these days is posting playing videos to my own channel on YouTube, with the purpose of introducing my arranges and the joy of Ragtime Guitar - especially "Classic Ragtime". On the page "Behind the video", you can read some stories behind the video performance, just like in a Blog style. Of course, you can watch my videos AGAIN through the link-icon　above. Maple Leaf Rag on GuitaLele... Check how "GuitaLele" fits Ragtime well!! Get the FREE Tab from HERE . YOU CAN PLAY MY ARRANGEMENTS! - getting TABS AVAILABLE for sale. The list of Tabs - including "Challenge Level". How to get? - Single buy or Friendship member system available. For information about FREE PDF, read the next section below. PDF Book "Great Pains - but all in vain?" is NOW on Sale - includes 4 famous rags. Now the Japanese PDF book "The Modern Ragtime Guitar Solos" has been on Sale again on my Japanese website, however, those who abroad could read NO part of my review for tunes nor the playing analysis which all written in Japanese... unfortunatelly. Please contact me, if you'd like to buy this RARE folio... while sorry for your great pains - in advance! You can see SAMPLE pdf - click the image left. To your order by e-mail, I send the mail-request for payment via Paypal. AFTER your payment confirmed, I send you the folio by E-mail (attached)... Thank You! However, it's better to E-MAIL ME informing your purchase... Thank You! Mar. 2016 ► 【NEW】 YouTube "Magnetic rag" 2016 version replaced in Tab-List. Mar. 2016 ► 【NEW】 YouTube "Tickled to Death" Also added to the List of Tabs. Dec. 2015 ► 【NEW】 YouTube "Sakkijarven Polkka": A Traditional in Finland. Jul. 2015 ► YouTube "St. Louis Blues". Also added to the List of Tabs. Jul. 2014 ► Re-posted 2 famous rags as "HD video". You can watch them above of this page. Jul. 2014 ► Posted on YouTube "Odeon - Tango Brasileiro". Final video for "Around Ragtime". Also added to the List of Tabs. Jul. 2014 ► Posted on YouTube "Steamboat Boogie Blues & Rag". This is a REAL Boogie guitar! Apr. 2014 ► Posted on YouTube "Turkey in the Straw", and check the page "Behind the video" to get PDF Tab sheet ! Apr. 2014 ► Posted on YouTube "Peacock Rag" as the version by John Renbourn. Not enough but some samples of my arrangements are available here and there on this site.., so in a hurry, you can get them through links below. *Note: This link page is opened as a new page. Thanks for closing it for yourself. E-book size: The Entertainer for beginners - made simply in the format of; A5 size, displayed only tab not musical notation. THIS IS A SPECIAL GIFT on this page. The Entertainer for beginners - details on "How to arrange > Sample". Full page available, but not full arrangement - only the famous sections, the 1st & 2nd. Maple Leaf Rag - details on "Tabs Available > The list of Tabs > Attention notes". Only the 1st page for excerpt. In "the List of Tabs", you can get excerpts to review - single page only - through the link in the cell "PDF", and listen MIDIs in FULL size. If you like it, CONTACT me for Friendship member to share all tabs! 21th Mar. 2016: "Magnetic rag" on "Behind the video". 1st Mar. 2016: "Tickled to Death" on the List of Tabs. For Friendship members, 2 other song UP in "List for Download". 13th Jul. 2015: "St. Louis Blues" on the List of Tabs. 3rd May. 2015: posted the article about Ragtime Fes USA. 27th Jul. 2014: "Odeon" on the List of Tabs. 29th Apr. 2014: Tab of "Turkey in the Straw" on "Behind the video". Excuse me for my poor English, however, I really wish you to communicate enough to share joys of Ragtime and my arrangements... Thank you!